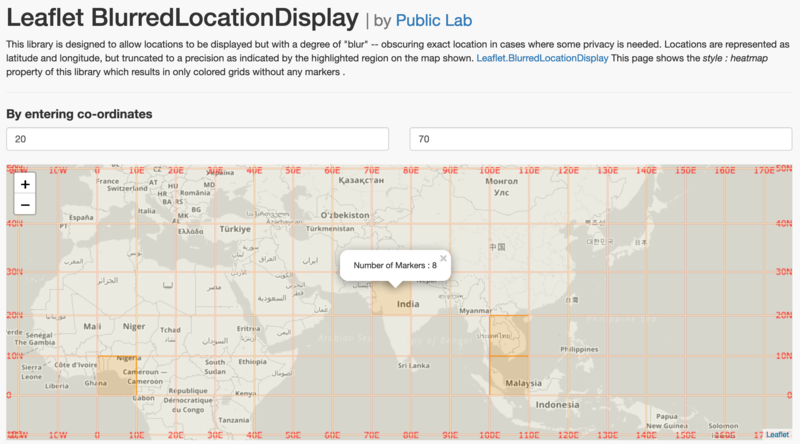 Want to be notified of new releases in publiclab/leaflet-blurred-location-display? Cleverly dispays "blurred" locations, keeping privacy settings in mind. Presents collections of blurred locations in a heatmap. Optionally color codes the markers on the map according to the precision. To set up the library first clone this repo to your local after that run 'npm install' to install all the neccessary packages required. remote markers = markers made from external API . local markers = markers made from static data provided directly into LBLD API . precision = number of digits after decimal . JSONparser = a function defined by User to parse external API . zoom_level = the current zoom level of the map . var map123 = L.map('map').setView([23,77] , 3) ; // There should be a div with id = 'map' . color_code_markers: false, // by default this is false . blurredLocation : This is compulsory field , you have to pass the LBL object here . locations : You can pass some local data directly to LBLD API in the form of array . source_url: URL to external API to fetch data and show on map . JSONparser: JSON parser function for your API URL provided . zoom_filter : An array signifying the range of zoom levels where particular precision markers should be visible . color_code_markers : If true , then markers would be color coded according to the precision of its coordinates . style : can be both where markers and heatmap both are drawn , markers for showing only markers and heatmap for showing only heatmap . Pass the data directly to LBLD object locally . Pass the URL of JSON data and a custom JSON parser function . Pass the URL in the source_url field and a JSON parser function for your API (you can take a look at the default JSON parser below to make your own !) . Make an array of object. Each object should have same parameters - id, url, latitude, longitude, title. All the above parameters are used to make pop-up of each marker. The below is also the default JSONparser which will be used automatically if you do not provide your own . The first number signifies the lower zoom level. The second number signifies the upper zoom level. The last number signifies that all markers having precision greater than equal to this number should be shown between lower zoom level and upper zoom level range. We can switch on the markers color coding feature which colors the markers according to the precision of its coordinates using color_code_markers parameter which is by default false. 'Blurred' location display Your exact location won't be posted, only the grid square it falls within will be shown till the level of precision you have set to your location. 'Blurred' human-readable location display The name of the location you added will be displayed till the level of precision you set as the extent of address depends on the precision level you currently are on. For instance for precision 0 only the country name will be provided as you zoom in precision will increase and so will the address details, such as state, city, etc.